Please note: This is the German version of GAMP 5. A version of this publication in English is also available. 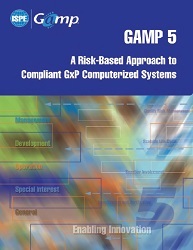 GAMP® 5 provides pragmatic and practical industry guidance to achieve compliant computerized systems fit for intended use in an efficient and effective manner. This technical document describes a flexible risk-based approach to compliant GxP regulated computerized systems, based on scalable specification and verification. It points to the future of computer systems compliance by centering on principles behind major industry developments such as PQLI; ICH Q8, Q9, Q10; and ASTM E2500. This revolutionary Guide addresses the entire lifecycle of an automated system and its applicability to a wide range of information systems, lab equipment, integrated manufacturing systems, and IT infrastructures. It contains new information on outsourcing, electronic batch recording, end user applications (such as spreadsheets and small database applications), and patch management. An exciting new innovation is the CD accompanying the softcover Guide. It provides supporting materials, including differences between GAMP® 4 and GAMP® 5, key diagrams, templates, forms, example documents, and background information. (CD is Windows compatible only.). If you order the secure PDF, these supplemental materials are included as downloads.